Goodreads Summary: Belly measures her life in summers. Everything good, everything magical happens between the months of June and August. Winters are simply a time to count the weeks until the next summer, a place away from the beach house, away from Susannah, and most importantly, away from Jeremiah and Conrad. They are the boys that Belly has known since her very first summer--they have been her brother figures, her crushes, and everything in between. But one summer, one terrible and wonderful summer, the more everything changes, the more it all ends up just the way it should have been all along. I’ve heard good things about Jenny Han’s Summer books for a while. Even though it’s no longer summer (though it still feels like it in Houston), I decided it was time to read these books. These books are the perfect read to pick up when you have a free afternoon or night and want to recapture the feeling of summer love. Belly Conklin has always loved summer. For her, summer is her real life, and the school years are just something to be endured. Every summer, she, her brother, and her mother go to the beach house in Cousins, where they stay with her mother’s best friend Susannah and her boys Conrad and Jeremiah. Belly has always longed to be one of the guys, but as the youngest, she’s always been excluded – until now. This summer, things are finally changing. This summer, she’s included in party invitations and allowed by the boys to hang out with them. And maybe, just maybe, this will be the summer that her crush on Conrad is finally returned. After all, this summer everything is different…if only Belly knew why. Before reading The Summer I Turned Pretty, I’d read reviews that said this book wasn’t simply a lighthearted story but instead had more depth to it. Even still, the story wasn’t completely what I was expecting. There is some romance, yes, and it definitely has a summery feeling – I felt like I was at Cousins Beach along with Belly, Conrad, and Jeremiah – but the book also examines how life is always changing and how certain events can change people. The story alternates flashbacks of previous summers at Cousins with the present-day narrative, and I enjoyed seeing how things unfolded in both timelines. As for the boys, it was interesting to see two brothers who were so different. Yet they both have their good qualities and their appeal, and it would be easy to fall for either one of them. I also liked Susannah’s character – she is just the kind of mom you would want, and she was a good second mother to Belly. The one thing that struck me about this book was that it almost seemed to be like an exposition for the next book in the trilogy. Although there was depth to some of the memories and characters that I enjoyed, I felt as though I was constantly waiting for something big to happen. However, I know that there is much more to this story, and I am looking forward to finding out what it is. 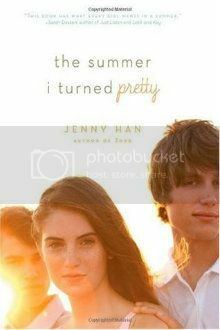 In The Summer I Turned Pretty, Jenny Han captures days on the beach and spins a story from them in an engrossing way. I am certainly glad all of the books are already out so that I don’t have to wait for more of the story! I bought this series last summer on my Nook and haven't had the chance to read them yet! I keep seeing reviews for them and how great they are,(even though it's been awhile since they've been published - always a good sign!). I HAVE to read them soon! I'm up in freezing cold Chicago, so maybe a beach read will cheer me up! Great review! ooh I actually felt this book was just so chilled and laid back that I really wasn't looking for something big to happen or anything like that. Sometimes its nice to just read a book and enjoy it, just fluff (even though it isn't just fluff). Like you said, I felt like I was at Cousins beach with them too when I read it! I hope the second and third are better reads for you! I enjoyed this book as well and my favorite boy was Conrad:) Thanks for the review! I haven't gotten to the rest of the trilogy yet but I did love this one for the way that it captured summer so perfectly. Jenny Han definitely has a talent for that from what I can see.